25 x "Rooïbos Fruits et Fleurs du Soleil" pyramid bags by Compagnie Coloniale. 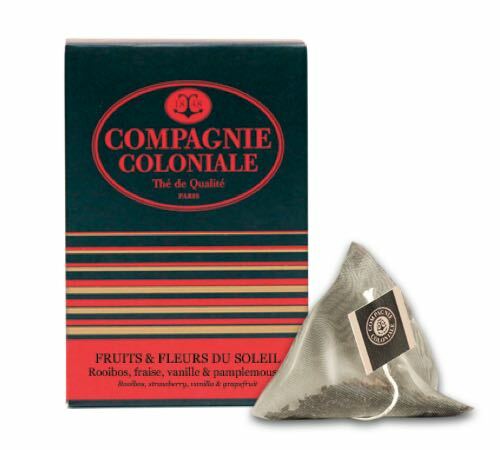 This Rooibos will seduce you with its lovely flavours of vanilla, strawberry and grapefruit! Caffeine-free. This organic 'Fresh Detox' herbal tea from Destination combines rosemary, aniseed, peppermint, liquorice and dandelion. For a caffeine-free drink with detoxing benefits. Box of 20 individually-wrapped tea bags.